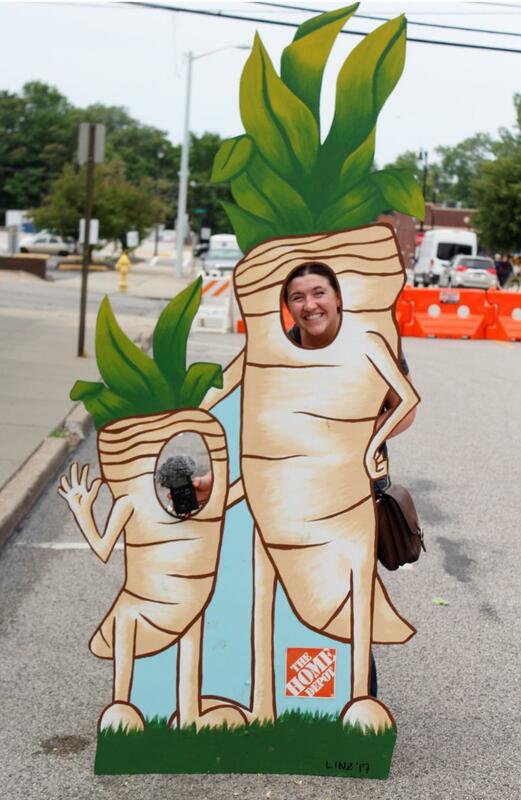 Harvest Public Media’s Madelyn Beck experienced the sights, sounds and tastes of the International Horseradish Festival. 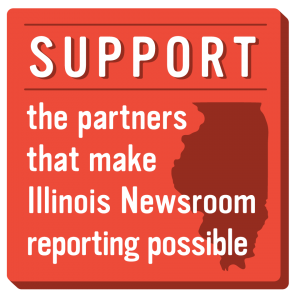 The festival, held this year June 1 and 2, was on Main Street in uptown Collinsville, which is about 16 miles from the Gateway Arch in St. Louis. Follow Main Street (left) far west enough, and it dead-ends at a horseradish field (right). Up to 80 percent of the world’s horseradish is grown here, according to festival organizers, though their past accounts have varied greatly: From 60 to 80 percent of the world’s horseradish to 60 percent of the nation’s horseradish. Either way, most horseradish sauces and dishes found in the U.S. comes from this area, according to the U.S. Department of Agriculture. You’ll find the ground-up root in mustards, shrimp cocktail sauce, even that green wasabi with your sushi. 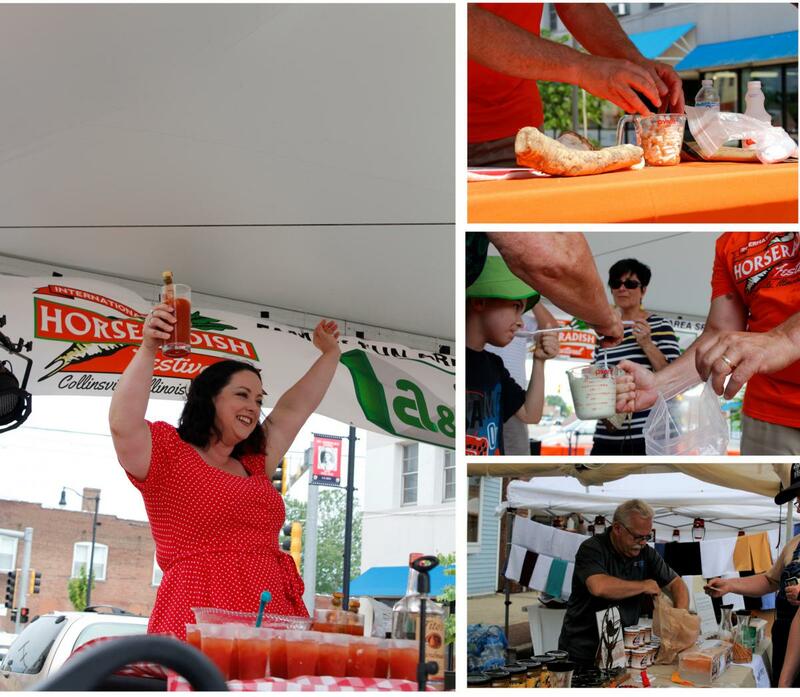 The International Horseradish Festival is always the first weekend June, but it hasn’t always been in the same place. The first year, 1987, was in an alleyway park, then moved to a bigger park far from Main Street. But organizers moved it back to the shopping district this year, bringing more business to local shops. Plus, it’s a bit more weather-proof. A brief, but intense rainstorm passed through the second day, soaking everything. “Had we been in the park right now, we’d be standing in mud,” Mayor John Miller said. 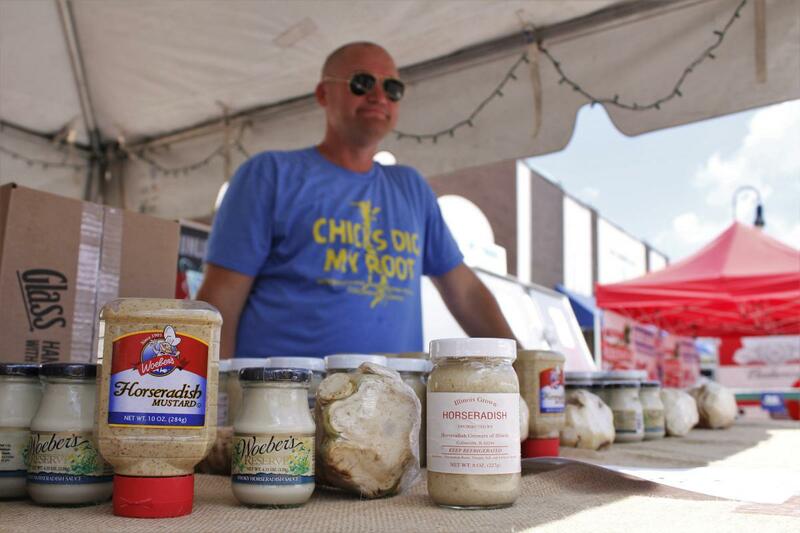 Horseradish grower Dennis Heepke (above) and his brother Jeff had a booth at the festival. They’re fifth-generation growers, currently cultivating about 200 acres of the root. They need more land than that because they cycle the crop every five to seven years, which deters pests and prevents nutrient loss in the soil. They grow soybeans and corn in those fields in the meantime. They said the area is great for growing horseradish because of mild winters and the loamy soil of the Mississippi River bottoms, which make for easier harvesting. Pretty much all wasabi in the U.S. is not from the actual wasabi root, the Washington Post reported in 2014 and Dennis Heepke pointed out: “A lot of wasabi, quote-unquote, is horseradish just dyed green, because wasabi is so incredibly expensive and hard to grow.” So next time you swirl that green paste into your soy sauce at the sushi restaurant, just know it’s probably from southern Illinois. 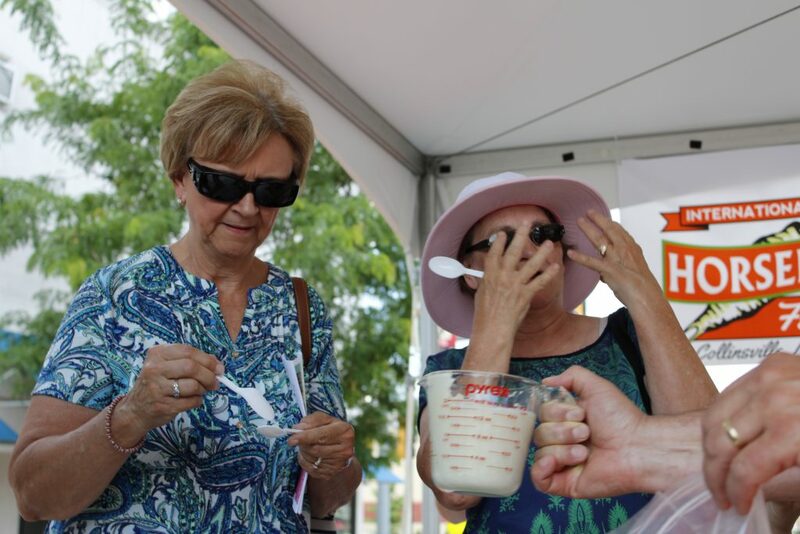 Even in the 95-degree heat, people craved the signature spice. Charlene Stunkard Anglin (left) won the popular Bloody Mary contest, which had enough free samples to make a happy crowd. She beat a previous champion who omitted a crucial ingredient: Bloody Mary mix. A “root garden” at the festival supplied Bloody Marys for everyone else: 56 gallons’ worth. Eight of that was horseradish, according to Gateway Center Executive Chef Carl Vollmer. Other horseradish-tinged dishes: Roast beef sliders with horseradish sauce, horseradish bratwurst to horseradish mustard samples. Charlie Adams (bottom right) showed up with Grandpa Spencer’s gourmet mustard. But Miller said the town is working to keep people around by fostering community activities like the horseradish festival, and noted that there are some new businesses that have just opened up and others considering moving here. 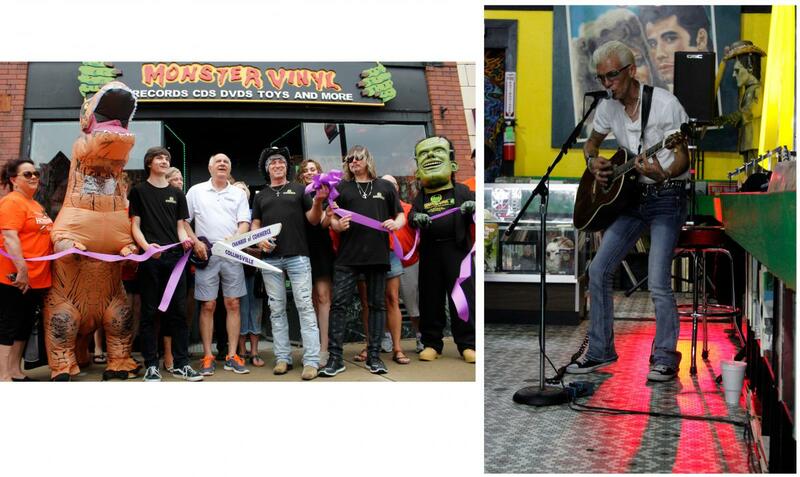 During the festival, Miller (left photo; fourth from left) cut the ribbon for a new shop, Monster Vinyl, with help from (left to right) T-Rex, Josh Wallace, John Miller, Bill Cherry, Sydney Mason, Scott Wallace and Frankenstein. Inside the shop, Mark London played songs for those popping in. There was plenty to do during the festival that had nothing to do with eating the zesty root, though it did figure into the name of the Little Miss Horseradish Pageant (bottom left) and in the horseradish root-throwing competition. 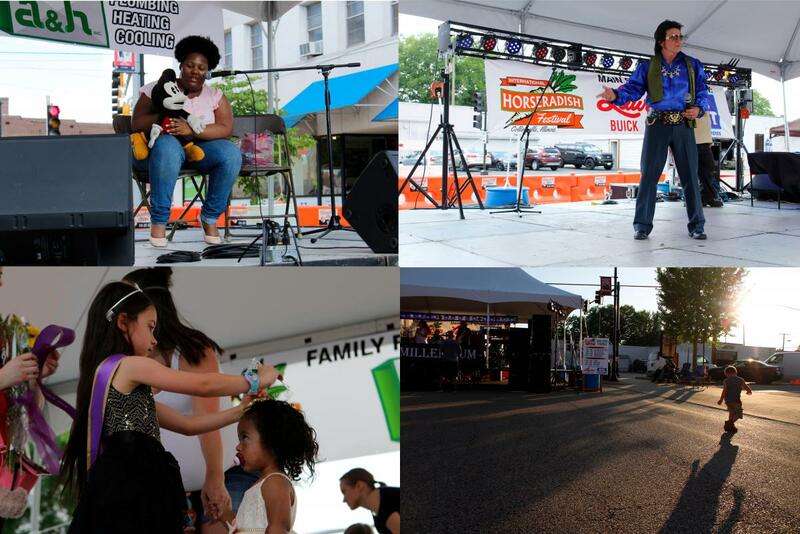 Otherwise, there was a ventriloquist (top left), live music of all genres, children’s games, washers tournaments and, of course, an Elvis impersonator (bottom right). If you go next year, don’t forget water and sunscreen. And build up your tolerance for spicy food.